Photo Credit: Bar Double L Beef. Wendi Lankister met her husband Keith while studying ranch management in college. Keith Lankister was studying to be a farrier. The couple found they shared a desire to start their own sustainable cattle ranch. After twelve years of working on ranches around the west gaining valuable insight into the processes of raising livestock, the Lankisters settled just outside Glenrock, Wyoming with their three daughters. Today, the Bar Double L Beef ranch is a profitable adventure in homeschooling, healthy living and grass fed certified organic cattle. 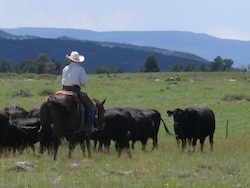 As is the case of many state or municipality owned ranches and range land, the 7,800-acre former Duncan Ranch was leased using a request for proposals system. Interested parties had to submit a business model that showed how they would utilize the land year round. Keith and Wendi came out on top, wining the bid. They began the Bar Double L Beef cattle company on the Duncan Ranch five years ago. A good relationship with the local weed and pest folks ensures that the Bar Double L Beef herd remain on non contaminated land at all times. “It’s our responsibility to keep an open line of communication with them,” shares Keith. “We have a document signed with weed and pest and they know what we’re trying to do.” The Lankisters use a system of grazing rotation to ensure that the animals are constantly feeding on fresh non treated grass. Working in tandem with the local ecosystem, the Lankisters manage to maintain a healthy herd. In the vein of many sustainable farming operations, the Lankisters operate side businesses to boost their coffers and teach their children how to be successful farmers. Members of the local 4H society, the Lankister girls run their own chicken business selling eggs to neighbors and friends. They are completely in charge of the business, keep the accounts, connect with customers and care for the birds without assistance from their parents. Including their children in the sustainable agriculture business is integral to the Lankisters’ way of life. Wendi Lankister manages a side business, “Mary Ann’s Beans.” Using locally sourced beans and non GMO spices, they create a range of dips and soups for local resale. For those who may not eat a lot of beef, Mary Ann’s Beans offers a natural alternative that’s always a hit at the local farmer’s market. Good relationships with other vendors means that Mary Ann’s Beans appear in stores in Wyoming, Colorado and Oklahoma. Maintaining an organic operation on Wyoming ranch land is a dream come true for Keith and Wendi Lankister. In an area where conventional range management abounds, the business model of Bar Double L Beef offers a viable alternative, bringing organic produce to rural families and showing how a sustainable lifestyle benefits present and future generations.